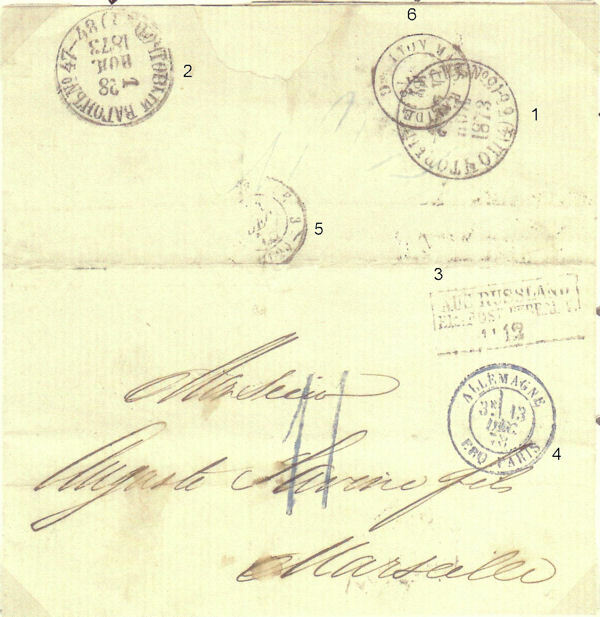 The stages of this letter's five day journey across Europe are revealed by six TPO / transit marks (the numbers are superimposed upon the image of the cover next to each mark and refer to the following numbered list of TPO and transit marks). TPO "POCHTOVIY VAGONY No 21-22" (ODESSA - KIEV) dated 27.Nov. 1873. TPO "POCHTOVIY VAGONY No 47-48" (ZHMERINKA - VOLOCHISK) dated 28.Nov.1873. (note prior to 1918 Russia still used the Julian calendar which was 13 days before the Gregorian calendar as in use by the rest of Europe, therefore Nov 28th in Russia was the same as Dec 11th in Prussia (Germany). 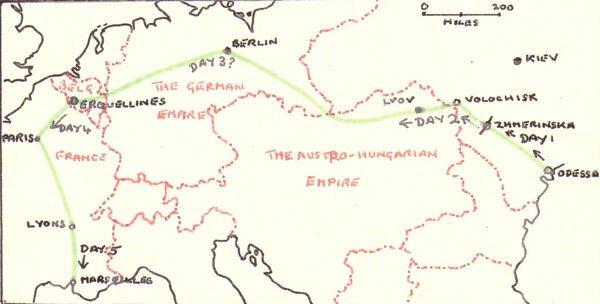 Unidentified mark "- - - E 3" Possible transit or receiving mark? TPO "LYON MARSEILLES RAPIDE" dated 14.Dec.1873. This cover featured in our Winter 2008 Auction.